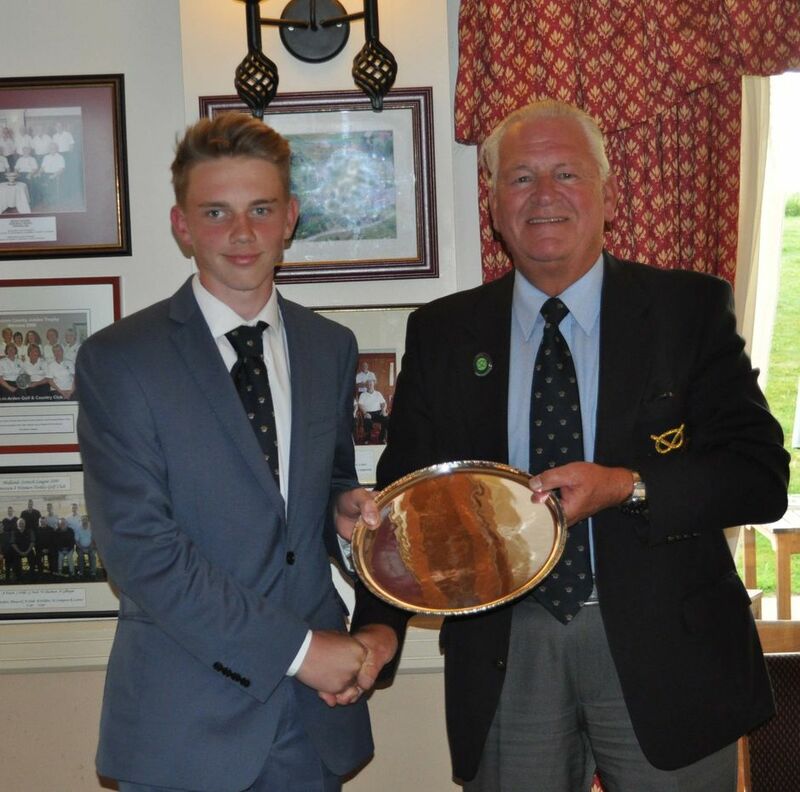 Under 16 Results :: The Union exists to promote golf in the County and to provide competition for the top county players as a route to Midland and International golf. Another excellent win for Staffordshire U16's who remain undefeated this season. Well done team Keep it up! 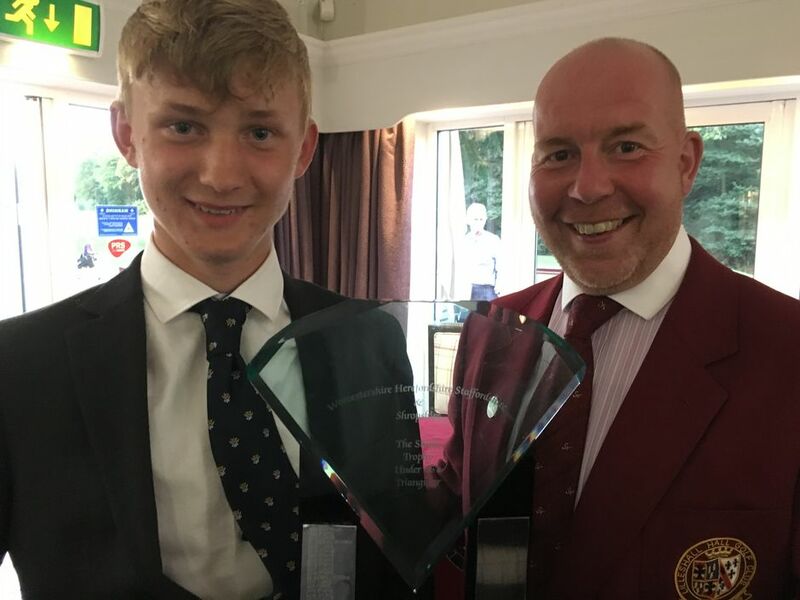 Staffs U16 Captain, Tom Morton receiving the Snelling Trophy from the Captain of Lilleshall Golf Club. Fantastic match. Staffs having lost the foursomes 4-1 went on to take 7 points out of the 10 available in the singles to win the match 8 -7. On a grey day and at a slightly soggy Trentham, 8 Staffs girls battled hard against the U16 County boys and came away with a well deserved halved match. All pairings were played in great spirit and all bar 1 game the results were extremely close. Well played to Morgan Thomas, Georgia Pritchard, Katie Symonds, Ellie Treadwell, Caprice Sanders, Jasmine Luo, Chloe Williamson and Oilvia Whittle. Congratulations to Team Manager Charlie Birchall and his team for beating the other nine Midland Counties in winning the 2016 M.G.U. 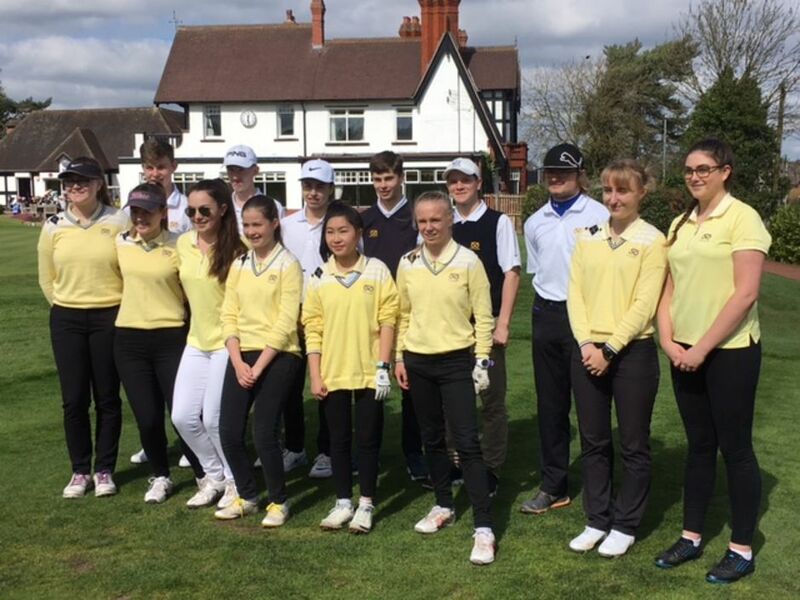 County Cup played at Great Barr GC. 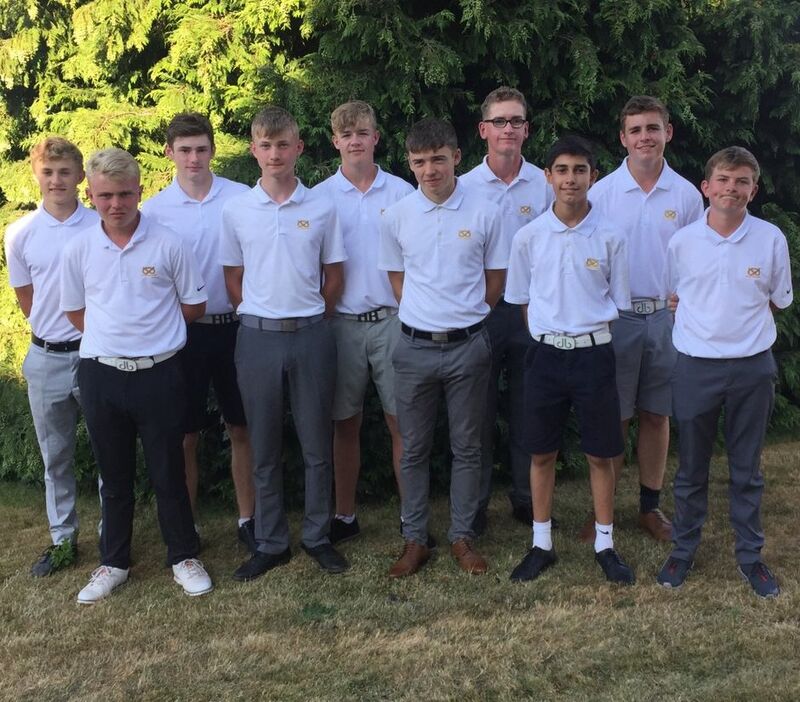 The team pictured below L-R Charlie Birchall (Team Manager) (Ingestre Park GC) Ellis Muckley (Great Barr GC), Zarak Curley (Leek GC), Harry Fearn (Trentham GC), Tom Alford (Branston GC), Matt Shelton (Captain) (Great Barr GC) and George White (Walsall GC). A win for Staffordshire boys was not as easy as the score suggests, despite a handsome lead of 5 - 1 in the morning foursomes. The result was in doubt until the back 9 in the singles when the Staffordshire boys pulled away for the win by turning round a couple of the singles games. 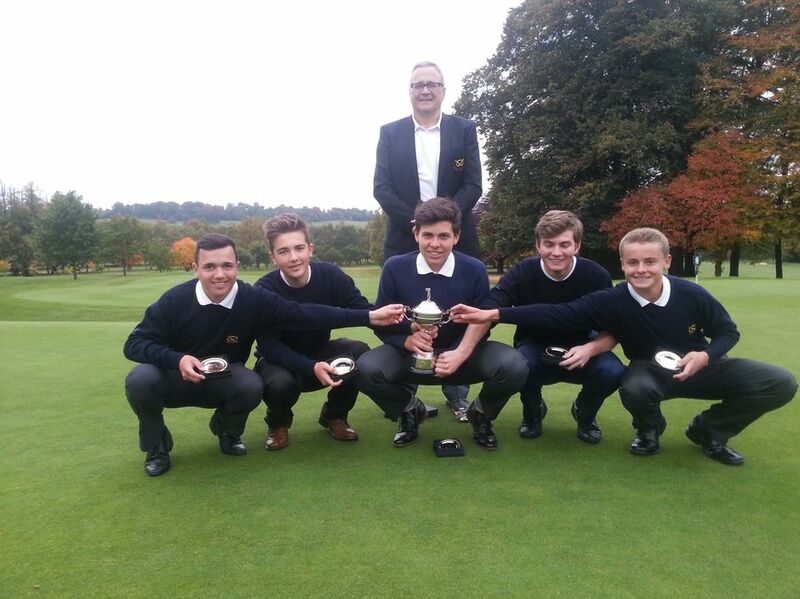 A very enjoyable U16 fixture over 18 holes of singles, provided good experience for the Staffordshire U16 boys. 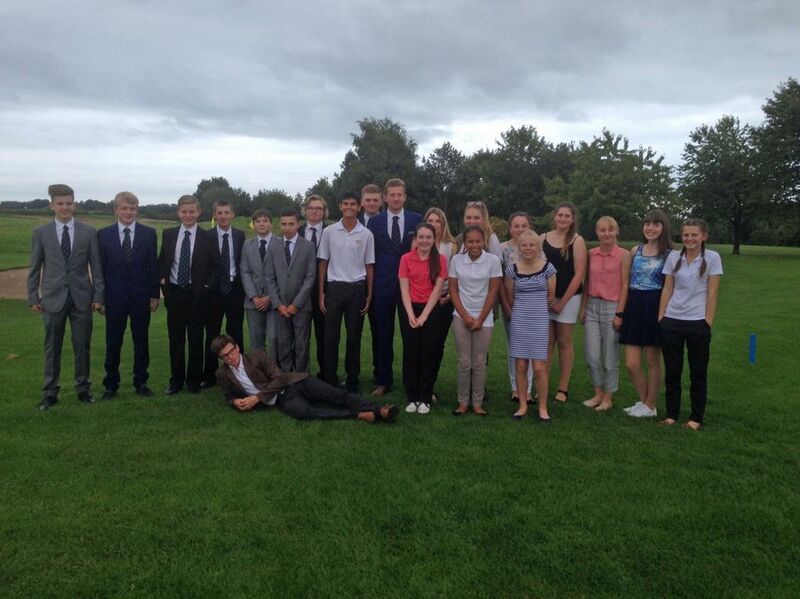 We were made most welcome at Crewe GC, where Cheshire were the winners by 6.5 - 3.5. 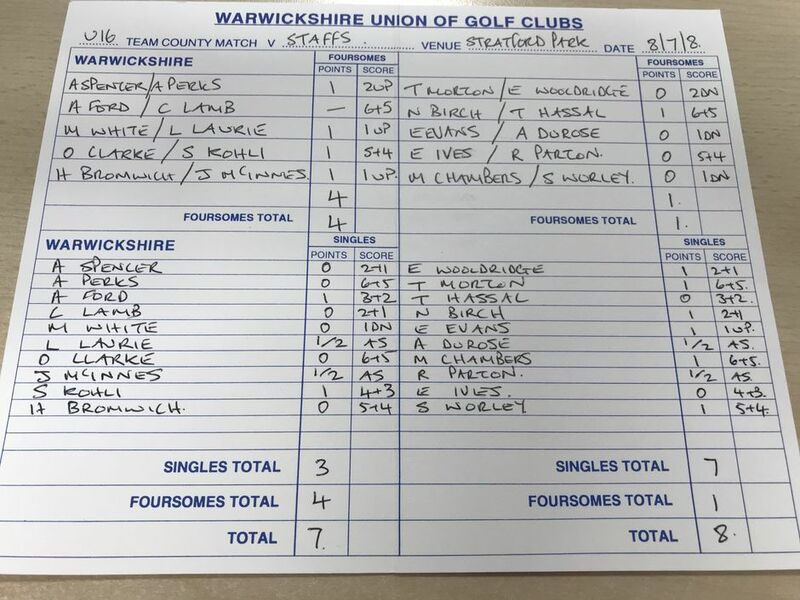 This annual three cornered match was again enjoyed by all on a very well presented South Staffs GC, whose officials welcomed, fed and watered all three Teams on the day. Winners were Shrops & Hereford 20.5, 2nd Worcestershire 17, and 3rd Staffordshire 16.5. 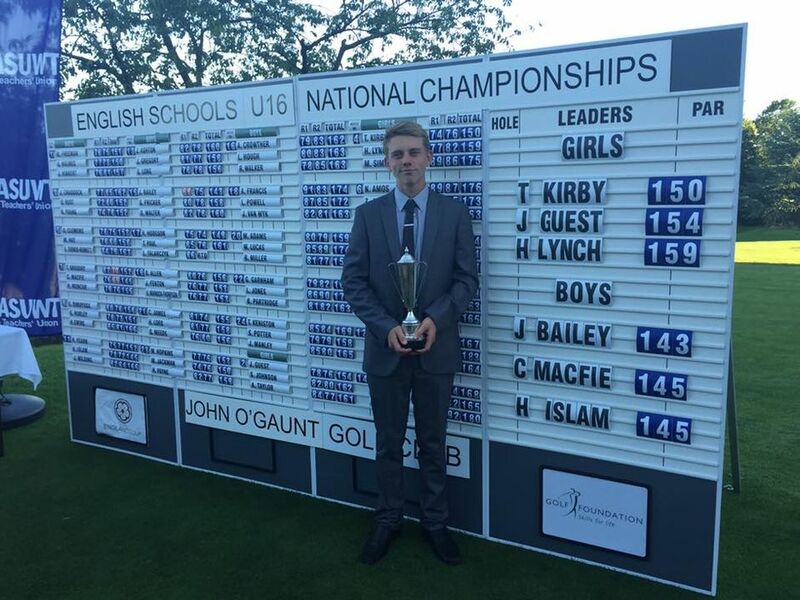 Well done to James Bailey (Branston GC) who won the recent English School's U16 Championships held at John O'Gaunt GC. James scored 68,75 and has now been picked to represent England School's in an International match against Wales in August. 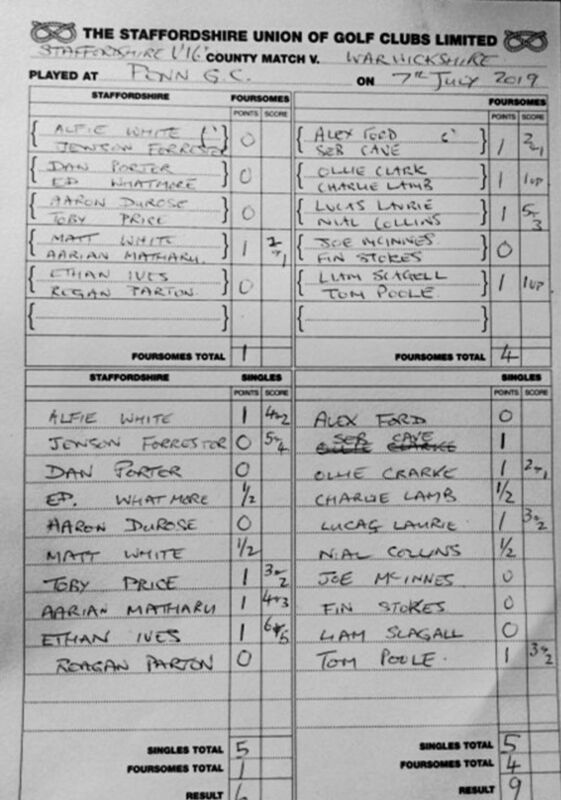 After a very promising start in the foursomes, the Staffs Boys faded to a share of the matches. The Winter matchplay knockout has concluded. 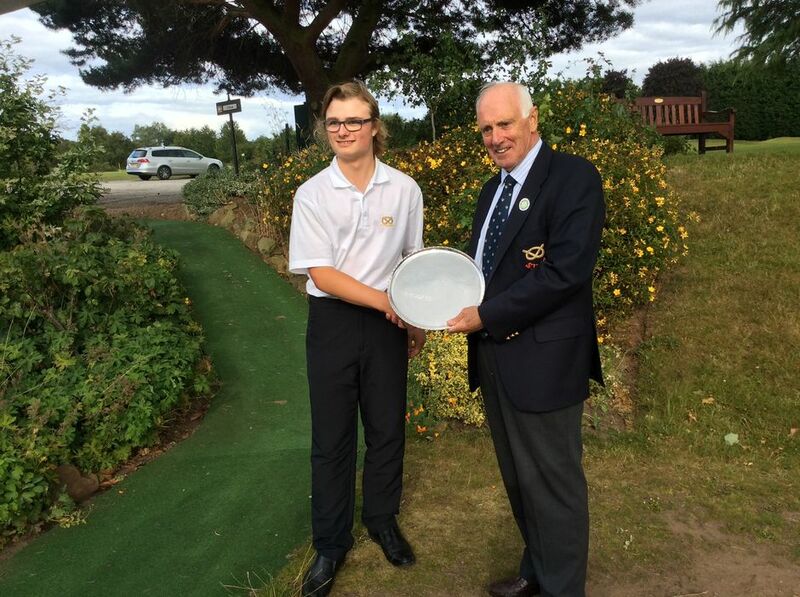 The winner was James Bailey (Branston) who managed to edge James Wilkes (Swindon) at the second extra hole as they were all square after the 36 holes final. He is pictured below being presented with the trophy by the Staffs Juniors Chairman. A very close match, with the result in doubt until the final stages. The Boys had to pull out all the stops to claim a win by 6 games to 4. Full results below. The second playing of this event brought some success for the Staffordshire Boys team of 6, who finished in 2nd place behind a very impressive Nottinghamshire. 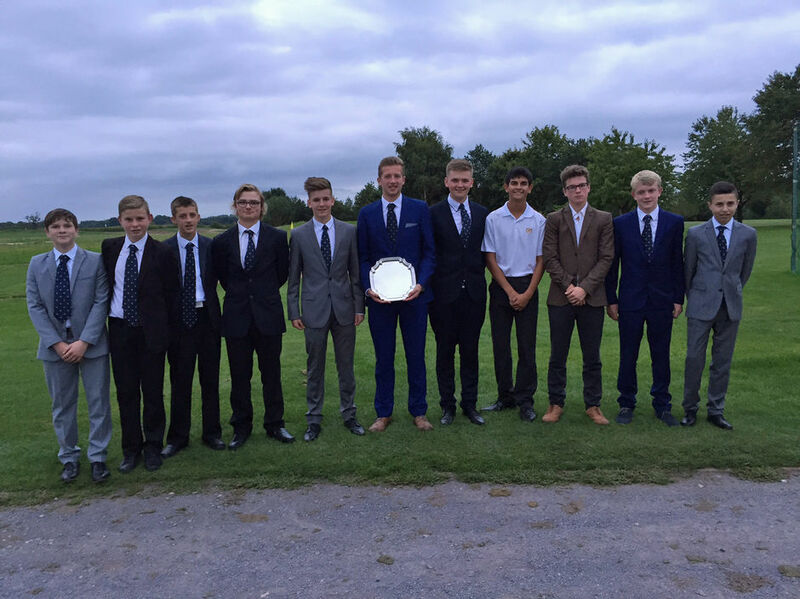 They also collected the MGU U16 League Trophy, being unbeaten in their W Midland League during 2015. Well done to all the boys. 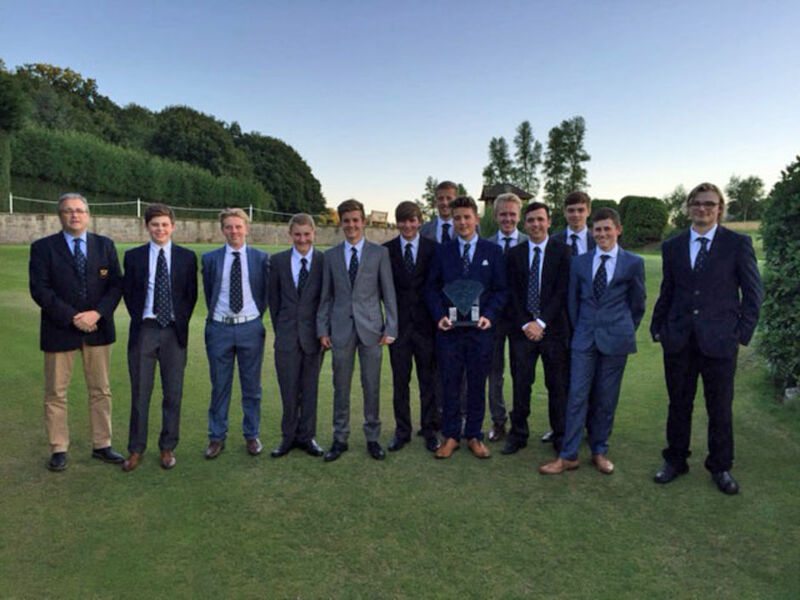 Photo below with their RU Salvers & U16 League Trophy, & Team Manager Charlie Birchall. This was the re-arranged match, after the washout in the Spring at Trentham. It was a very close match enjoyed by all, which the boys managed to win by 5 games to 4. A very enjoyable, & keenly fought Tri-Match. 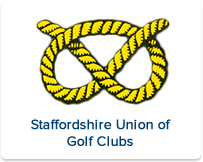 Staffordshire managed to edge ahead of Shropshire in the last few singles matches in the afternoon to win the trophy, and post 2 wins in the U 16 MGU League. 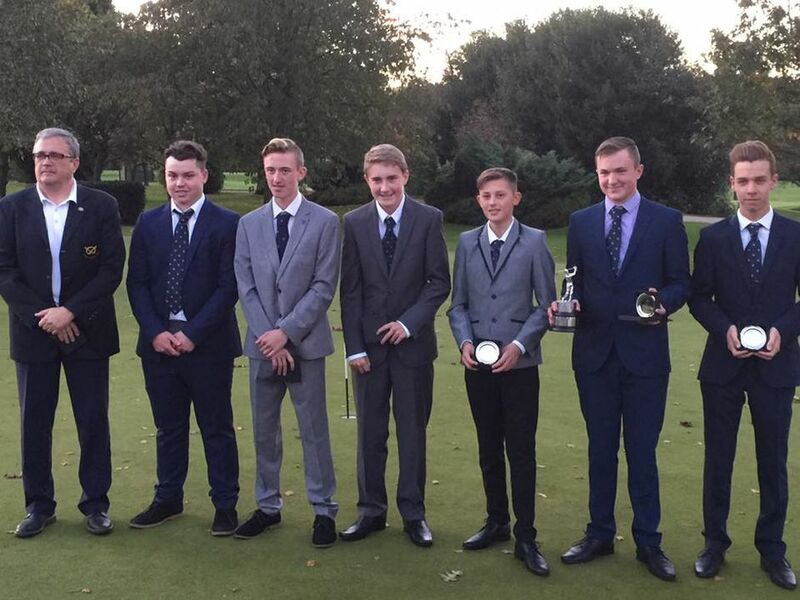 Well done to the U 16 Boys of Staffordshire who have won all 4 MGU U16 League matches in 2015.